Street ported fully CNC, non-emissions head. For customers with blocks that are machined for 7/16 in. head bolts, the use of TFS-51400419 head bolt bushings is required. Set-up for hydraulic roller cam shaft only. Something great just got better! Trick Flow has taken its track-proven Twisted Wedge design and, using advanced 3D solid modeling and CAD tools, plus a couple decade’s worth of racing experience, has made it even more potent for serious performance enthusiasts and racers. 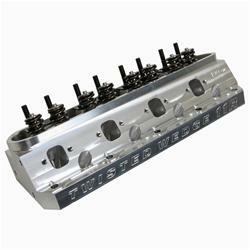 Trick Flow’s new Twisted Wedge® 11R 190 cylinder heads feature 11° intake and 13° exhaust valve angles and a restructured combustion chamber arrangement for more airflow and performance potential. The new high velocity, race-inspired runners have been optimized for today’s popular bore and stroke combinations. Premium certified materials and components, along with the finest CNC tooling, are used to ensure uncompromising quality and durability, dimensional accuracy, and balanced flow from port-to-port. Fully machined castings increase strength and project a great-looking billet-like appearance. Twisted Wedge 11R 190 heads with CNC Street Ported runners are great entry-level CNC heads combining fully CNC-machined runners and combustion chambers with a standard resolution surface finish for significant performance gains. Twisted Wedge 11R 190 heads with CNC Competition Ported runners feature fully CNC-machined runners and chambers with a premium high resolution finish for ultimate performance. The heads are a direct replacement for previous Twisted Wedge heads and work with all Twisted Wedge specific pistons. Cylinder heads are available fully assembled or as bare castings. Sold individually.